I was born in the ‘50s, and grew up in the 60’s and 70’s. I remember shows like Donna Reed and Father Knows Best, where the Mother was always wearing an apron and being sweet and kind, and the Father was the breadwinner and the wise one. By the end of each show, everyone was happy, all problems were resolved, and everyone knew their place. On the surface, so many families seemed to be the same; yet, underneath, most were not even close. In this kind of ‘pretend’ environment, my parents divorced in 1964. I remember how hard it was for my mother when she became a single mother with three little girls, trying to make ends meet to put enough food on the table and keep the roof over our heads. I remember how afraid she was, how alone she felt, and how judged single mothers were at that time. I remember the feminist movement. I remember people (not only men) totally trashing the women who were speaking out. These women were speaking out to effect real change so that women, like my mother, could get better jobs, earn more money, and have a modicum of respect in the culture. We were trying to break free from the chains and bindings that had kept women contained. I remember how these women who led the women’s liberation movement were called horrible and ugly names for speaking out. At my young age, I remember how much I feared being cast-out like that, cast-out for speaking out with power about the truth of how things really were…and are. I am not saying all feminists were right and righteous, and those who opposed them bad; what I am saying is that the cultural paradigm of patriarchy rose up fast and hard to put these women back in their place. It wasn’t pretty. I remember the not-so-easy discourse around the Equal Rights Amendment (ERA). I remember wondering why on earth we needed the ERA. I had learned in school that we were all equal under the constitution. I was beginning to see that real life did not reflect our founding documents or what we saw on television. In growing up, I was beginning to clearly see the truth of the world I was becoming an adult in. I remember being amazed that the ERA did not get ratified in all fifty states. It is still only in effect in twenty-one states. I remember wondering why people would not want women to have equal rights? What was that about? In hindsight, I see how the women’s liberation movement had to push hard against a societal construct that was trying to keep women controlled and dominated – in the kitchen, or if they were working, making much less pay with a whole lot less options; how it seemed like the only way out was to prove that we could do what men did just as well as they did it; and how ‘traditional women’s work’ was not the only thing we could do. I sit here remembering so many ways in which women have been undervalued for far too long. I sit here remembering how hard women, and some men, have worked for equality for women. It took decades of women fighting for the right to vote to finally win what in hindsight seems only right and natural. Why? Now in my fifties, a grandmother to four beautiful children, I see this world as it is right now in 2013. I see how little heart is in the institutions of our current culture. I see, still, how little our culture values traditionally ‘feminine’ things such as caring for the poor, teaching the young, honoring the elderly, valuing wisdom, taking care of the planet, and making sure all people have access to basic human needs. I see that somewhere back in the history of humans, caring for children, caring for others, and caring for the home became something less than, something looked down upon, something not of value. I see how women still are not valued, how feminine traits are denigrated, while masculine ones continue to be praised and admired. What has this devaluation of the feminine done to our world? When we don’t value, deeply value, that which is at the root of relieving suffering in human lives and the human heart, valuing the very planet on which our lives (and the future lives of generations to come) depend, and seeing the beauty and sacredness of life itself, what do our lives boil down to? 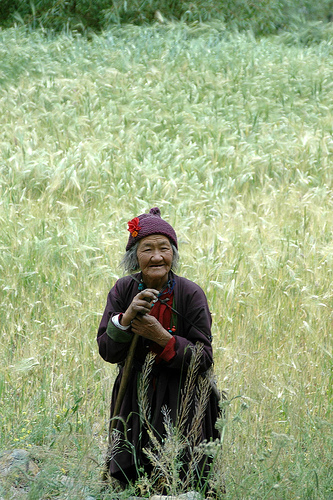 Woman in a barley field, Ladakh, India. Tenderness of the heart and tending the hearth are not inconsequential offerings. Both literally and metaphorically, our world is hungering for these. It is inhumane to expect people to continually pull themselves up by their own ‘bootstraps’ without needing anything from anyone. That is what’s expected in a hyper-masculine culture where being needy for anything or anyone is weak, and holding emotions in is strong and righteous. It is inhuman and inhumane. What is human is the way of the heart, of connection and relationship. We do need each other. It’s a very human thing to need each other. Being human is a vulnerable proposition. To think otherwise, is to pretend we are separate from each other, or that we are machines of some kind. I remember, somewhere deep within me, a time when I knew life differently as a woman, a time when women walked as noble beings. We can walk again as noble beings, knowing we embody the Feminine and are sacred vessels for life. We can walk again as noble beings, knowing the earth, too, is a sacred vessel for life. It is a deeply sacred relationship women’s bodies have with the earth body.To bring the heart back into life, it is time we women value our femaleness: our power to nurture and nourish, our ability to feel deeply, our wisdom that fills our bones, our vibrant and sacred creativity, our vital life force that fuels our sexuality, our powerful voices, and our capacity for fierce, fierce love. This is not in place of our ability to get things done in the world – we know how to do this. Rather, it is bringing this awareness, this value, and this knowing back into our daily lives. 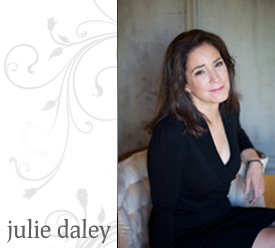 In valuing these things, we bring ourselves back into balance, a balance of the masculine and feminine within. As we do this, as we embody our femaleness, aware of the sacredness of our bodies, we model what it is to respect the feminine in a world that has forgotten how to do so. And as we do this, we hold out our hands and hearts to the men in our lives, inviting them to do the same – to respect the feminine within us and to embody the feminine within themselves. May we all, women and men, walk on the earth with feet of love. May we all become conscious of the immense gift of life, and allow this knowing to wake us up to the joyful responsibility we have to be engaged, creative, and giving members of this world village. Originally posted at Roots of She.